SAN JOSE, Calif., April 11, 2019 /PRNewswire/ -- Numerify, the leader in IT Business Analytics for the Global 2000, today released a commissioned Forrester Consulting study quantifying the Total Economic Impact and benefits of the Numerify System of Intelligence™ platform. Forrester found that enterprises that use Numerify IT Business Analytics solutions received an average 214% return on their investment over three years and recouped their entire investment in less than three months due to reduced incident volume, increased employee productivity, and reduced outsourced vendor spend. Earlier research conducted by Numerify indicated that IT Business Analytics is rapidly becoming an investment priority for IT leaders, with 74% of survey respondents considering it critical. Yet, almost half the respondents relied on spreadsheets or other informal analytic techniques to provide them the insight to run their IT organization. This results in a lack of visibility across their IT processes, projects, and people, leading to increased costs, slower innovation, and increased risk. "We're delighted that this study has validated what our customers have been telling us all along: that we provide significant and measurable value – more than $4 million over three years," said Gaurav Rewari, Co-Founder and CEO at Numerify. "Our prebuilt solutions embed Business Intelligence (BI) and Artificial Intelligence (AI) models that enable enterprises to reduce costs and risk and increase agility and revenues." "This study also validated that our customers are able to deploy Numerify in under six weeks, compared to year-long projects for organizations that have attempted to develop such analytics on their own. Delivering immediate value to our customers has been critical to our success," said Rewari. Reducing incidents by 30%, resulting in a cumulative three-year cost savings of over $2 million. By providing insights to the true root causes of incidents and by enabling prevention of recurring incidents, Numerify customers use resources more optimally while improving the service experience for internal users and customers. Automating the manual process of collecting and organizing data into analyses and reports, resulting in a cumulative three-year benefit of almost $1 million. IT staff were able to spend less time on mechanical and error-prone reporting, and instead focus on understanding the insights to drive better business outcomes. Increasing visibility into SLA compliance and ticket tracking for functions outsourced to external vendors, resulting in a cumulative three-year costs savings of $1.2 million. By proactively managing vendor performance, and by engaging in more informed contract renewal negotiations, Numerify customers were able to reduce costs while simultaneously improving service experience. According to an IT transformation leader at a Fortune 50 company quoted in the study, "The value we see with Numerify is in becoming a system of intelligence – combining various systems of record to bring a holistic view across the IT landscape." 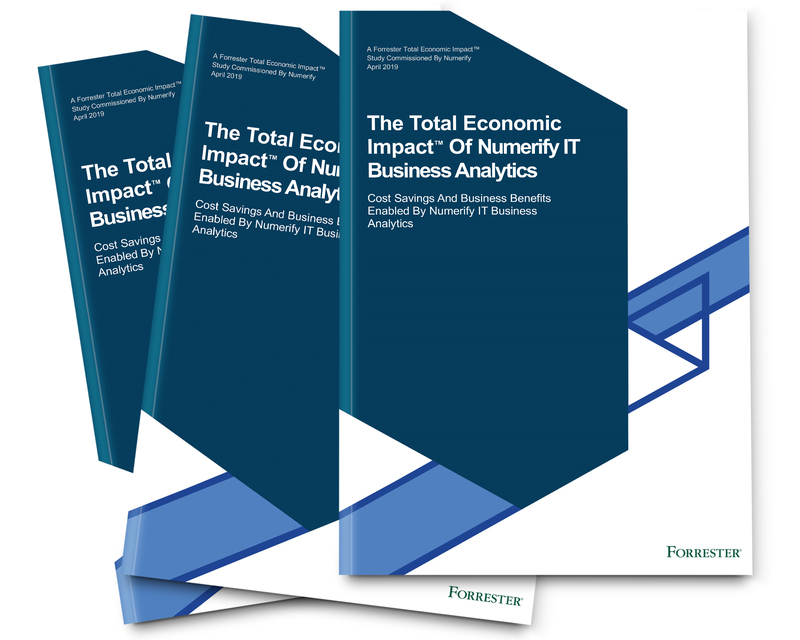 To create this independent study, Forrester Consulting leveraged its Total Economic Impact™ (TEI) methodology and interviewed a representative sample of current Numerify customers. Forrester used the learnings from this research and customers' responses to formulate a composite organization. Forrester subsequently calculated the quantitative and qualitative benefits of using the Numerify System of Intelligence™ platform. Numerify is the leader in AI-powered business analytics for Global 2000 IT organizations. Trusted by leading brands, including 5 Fortune 50 and 12 Fortune 500 enterprises, its System of Intelligence™ helps IT organizations plan, build, and run the systems that power more than $500B of commerce and achieve measurable ROI by becoming more efficient and agile, while reducing risk and disruptions. Numerify is headquartered in San Jose, CA with offices in Chicago, IL, and Bangalore, India and is backed by Lightspeed Venture Partners, Sequoia Capital, Tenaya Capital, DAG Ventures, Silicon Valley Bank, and Four Rivers Group. Visit www.numerify.com and join the conversation on Twitter @numerify.